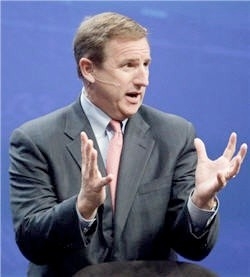 "Wild news out of HP just now -- CEO Mark Hurd has just resigned over a sexual harassment investigation. Hurd and the HP's board of directors decided that he should resign following a sexual harassment claim against Hurd and HP by a former marketing contractor -- HP claims that although there was no violation of its sexual harassment policy, Hurd violated the company's standards of business conduct by submitting inaccurate expense reports that covered his relationship with the contractor." Absolute power corrupting absolutely? You betcha'. HP acted fast on this one - and it came to the fore because the woman involved had an attorney and contacted HP. Lots of missing information here, but I find it depressing that in typical white-collar fashion, when someone gets caught doing something wrong, they don't get punished - they get rewarded with a $12 million dollar severance package and stock options. Seriously, what the hell? What a morally-inverted world we live in...equally interesting that Engadget doesn't mention Hurd is married and has two kids.